Most of the pre-season buzz in the NASCAR Busch North Series has been centered on the superteam of Grizco Racing. That team has a line-up that includes three-time defending champion Andy Santerre and eight-time NASCAR Touring titlist Mike Stefanik as full-time competitors and two-time Busch North champion Brad Leighton running a limited schedule. The team looks unbeatable on paper, but things don’t always work out as planned either. Meanwhile, sitting behind a Dodge dealership in Vermont is a darkhorse team with the potential to beat them all. That is quiet #45 operation of driver Brian Hoar. 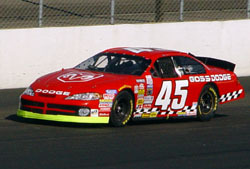 Hoar debuted in Busch North by winning Rookie of the Year honors in 2001. Since then, it’s been an up-and-down ride for him. His rookie year produced seven top-ten finishes, but in 2002 Hoar cut back to only running less than half of the Busch North schedule. He made the race that he did run count, though, by finishing second to Leighton in front of a NASCAR Cup audience. 2003 was an up year. Hoar contended for the Busch North title, finishing fourth in the final standings, and winning at Thunder Road Speedbowl. Things were looking up for last season, but luck didn’t get the memo. 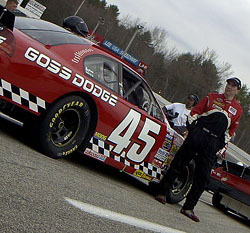 Hoar had a dominant car early on at Thompson Speedway in the year’s second race and he got caught up with a lapped car and ended up parked against the turn-four wall. That set the tone for a season where he ran well, but was only able to muster three top-five finishes and a tenth-place points’ finish. “We had a great car in practice at Stafford and one of the guys hooked the sway bar up wrong. We realized that right before the race and were guessing at the set-up. Stuff like that kills us. 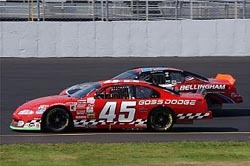 We had flat tires at Loudon when we had dominant cars. At Thompson, we had a dominant car and put it into the wall [after contact with a lapped car]. It was crazy stuff. If we looked back at last season and took some of the times that we hurt ourselves out, we would have been right there." 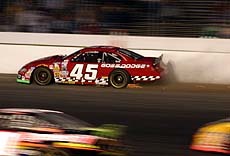 Hoar, Osha and the #45 crew members all go back a long way. Their relationship dates back to the days when Robbie Crouch was working out of a Vermont shop and terrorizing the ACT ranks with victory after victory. Hoar followed Crouch’s footsteps in ACT competition by posting some very impressive numbers there before moving to Busch North. He collected 23 career victories in ACT – just one shy of the combined career total of current hotshoes Jean-Paul Cyr, Brent Dragon and Patrick Leperle. Hoar also took home a few ACT champions trophies as well. 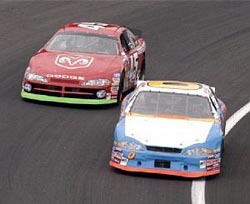 He first won the title in 1993 and then finished out his ACT career by going undefeated in the championship department from 1997 until leaving for Busch North after the 2000 season. Now Hoar hopes to be able to start a similar streak in Busch North and he feels that he is primed to be able to do just that. Hoar isn’t writing the season off to just plain bad luck, though. Ironically, the emergence of a Grizco superteam has helped to bolster Hoar’s program. He has picked up Karl Osha, the former Grizco crew chief for Stefanik, in the off-season. Osha lives in Vermont and did not choose to be a part of the Grizco relocation to North Carolina during the off-season. Hoar saw an opportunity and quickly signed a new addition to his team soon after the Grizco changes became known. Williams has been racing for awhile now. And then there is the dealership with a showroom out front and race shop out back. Hoar grew up around the family-owned and operated store. There are plenty of capable teams waiting in the wings to challenge Grizco – Mike Olsen has won a championship before with his band of tight-knit crew members from rural New Hampshire, Ryan Moore will have support from the DEI powerhouse in North Carolina; Mike Johnson won the NASCAR Toyota All Star Showdown to cap off his 2004 season and his family-owned team from coastal Massachusetts is ready to back that up; Dale Quarterley is ready to take his team to the next level and Matt Kobyluck has the support of the glamorous Mohegan Sun Casino to go after a championship. Hoar currently doesn’t have much time for boating or snowmobiling. He is a very busy guy these days. He is the General Manager of Goss Dodge during the day, a Busch North driver during the weekends and family man all of the time. “It’s difficult balancing the work, the racing and my family,” said Hoar. “The order of priorities in my life goes family, work, racing and everything else. You balance the family and the work and then comes the racing. But we all know how much time this sport takes. It’s a total balancing act and I don’t even know how some people do it. I wonder how I can do it sometimes, but it comes down in my case that I’m a jack of all trades and a master of none. Hoar has three children, his stepson Justin Prescott who turns 18 this month and two little girls. That adds to the balancing act. And at least once, Hoar has been able to mix his two businesses. It’s hard to track what sells cars and trucks, but when Mark Durgin drove up to buy a new Dodge truck from Hoar after the two raced against each other in Busch North two seasons ago, Hoar did know that at least once, the racing connection paid off. “Fifteen years in racing and I’m pretty excited to say that we definitely know that we sold one vehicle because of the team after all this time,” joked Hoar. 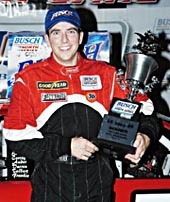 Hoar and the rest of the Busch North competitors will get their 2005 seasons started this weekend at Lee USA Speedway.